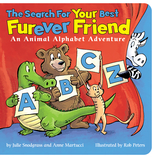 The Search for Your Best Furever Friend, An Animal Alphabet Adventure is a story that young children will enjoy again and again. The colorful illustrations and delightful text will capture the attention and imagination of young learners. Although the "animal" narrator is making a case for being a best friend, this book will show the variety of animals that could possibly fill that role. The book provides a good lesson for young children - it's possible to have many "best" friends. "This clever book uses animals to explore the alphabet with young children and help them discover that it is possible to have fun adventures with many different friends."